Is Monsanto erasing the line between what is natural and what is not? NAMPA, IDAHO - On an unseasonably cold afternoon in early May, Paul Rasgorshek is making the rounds of his farm, some 3,000 acres perched in the lava-rimmed country on the edge of the Snake River. Wet clouds scud out of the Owyhee Mountains, and from behind the wheel of his pickup, Rasgorshek juggles the two-way radio and the Nextel cell phone that he uses to coordinate the farm’s 17 employees. Then he eases the truck to a stop to take a close look at the future of farming. A new field of alfalfa plants pokes up green and lush from the rough ground, surrounded by what Rasgorshek, with the slightest trace of a savoring grin, calls “the dead carcasses” of freshly killed weeds. 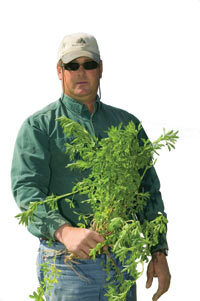 Farmers here can typically get about three good years out of their alfalfa fields before weeds begin taking over. Then, they often use an herbicide called Roundup to — in a euphemism that makes them sound like botanical mafiosi — “take out” the alfalfa and clear the field for another crop. Roundup is a potent plant killer, but the alfalfa in Rasgorshek’s field has been genetically engineered to be immune to the herbicide. That feat of agricultural alchemy allows farmers to spray their fields without damaging the crop itself. “It’s just amazing that you can spray something over the top of the alfalfa, and it doesn’t kill it,” Rasgorshek says. Yet Rasgorshek is growing what is at least temporarily an illegal substance. On May 3, a federal district judge banned the sale or planting of Roundup Ready alfalfa until the U.S. Department of Agriculture conducts a full environmental impact statement on the crop. It is the first time such a rigorous review has ever been required of a genetically modified crop, and the ruling could have significant implications for all such crops, which now cover the vast majority of the nation’s farmland. Over the past decade, genetic engineering has profoundly transformed American agriculture. Monsanto stands at the forefront of that endeavor. Today, roughly half of the U.S. corn crop, three quarters of the cotton, and 85 percent of the soybeans are genetically modified in some way. Alfalfa — the favored fare of dairy cows, beef cattle and health nuts — is an unlikely flash point for the controversy over genetically modified crops. Yet the legal fight over Roundup Ready alfalfa attests to just how far Monsanto’s massive foray into crop genetics has reached — and it is just one piece of a pair of larger, interrelated controversies in which the company is now entangled. One centers on the environmental impacts of genetically modified crops. Evidence is mounting that such crops, which were introduced after undergoing only cursory review, have led to the appearance of “superweeds” that have themselves mutated to survive Roundup herbicide and threaten to impose new costs on farmers and the environment. And, while the long-term human health implications of those transformed crops are still not understood, there are reports that Monsanto’s proprietary genes have contaminated traditional and organic crops, transforming the very nature of the food we eat. But Monsanto is also embroiled in a second controversy. The company has intervened not only in the genetic architecture of the nation’s food and feed crops, but in the very business of American farming itself. Monsanto now faces mounting legal challenges from its seed-growing competitors. It appears that the saga of Roundup Ready crops is ultimately less about genetic manipulation than about corporate power. Through a comprehensive scheme of takeovers, acquisitions and alleged strong-arming of competition, Monsanto is building an empire. Along the way, it seems to be erasing the line between what is genetically engineered and what is not. The active ingredient in Roundup is a chemical called glyphosate. First introduced in 1976, the herbicide is, unlike earlier generations of pesticides, relatively safe because it targets a metabolic pathway found in plants but not animals. Monsanto’s patent for the chemical gave it de facto monopoly control over the glyphosate market, and in 2000, half of Monsanto’s $5.5 billion in sales came from Roundup. But the patent was about to expire, opening the door for other companies to start manufacturing and selling glyphosate themselves. Four years earlier, however, Monsanto unveiled the first in its stable of Roundup Ready crops, which promised the company a way to maintain its lock on the glyphosate market. In fact, some of Monsanto’s foes now argue, the entire Roundup Ready enterprise has been as much about engineering the market as it was about engineering the crops themselves. The rough sketch of the story goes back to the 1980s, when, during a routine survey of the waste piles at a Roundup-manufacturing facility in Louisiana, Monsanto scientists discovered mutants: bacteria that — thanks to the evolutionarily intense selective pressures of the environment in which it lived — had become immune to Roundup. If it were possible to insert the Roundup-resistant gene from the bacteria into crop plants so they could be doused with weed killer without sustaining any damage themselves, the continued demand for Roundup was practically guaranteed. Sensing a moneymaker, Monsanto extracted that gene from the bacteria; eventually, the company devised a way to hitch the gene to another type of bacteria, which was then used to shoehorn the gene into crop plants. After gaining quick regulatory approval from the U.S. Department of Agriculture, Monsanto first licensed the Roundup-resistant gene to a company called Asgrow and the seed giant Pioneer Hi-Bred, which inserted them into soybeans and released them in 1996. Roundup Ready cotton and canola followed in 1997; Roundup Ready corn in 1998. In the years since, Roundup Ready crops have been a huge commercial success, and they have transformed Monsanto as well. The company that made its name in chemicals now makes far more money from seeds than herbicides: Last year, 70 percent of Monsanto’s $3.5 billion profit came from seeds, according to documents filed with the Securities and Exchange Commission. Alfalfa’s humble bearing belies its agricultural importance. It is the fourth-largest crop in the nation, after corn, soybeans and wheat; in the 11 Western states, alfalfa is grown on about 5.6 million acres, or nearly a quarter of the total farmland. 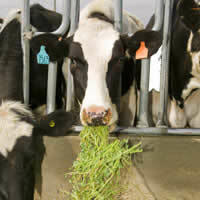 A dairy cow can eat as much as six tons of alfalfa a year, and the plant is also an important feed for beef cattle and horses. Seven percent of the alfalfa produced in the U.S. is eaten directly by humans in the form of sprouts; smaller amounts go into pellets of the sort fed to pet rabbits; and alfalfa is one of the main sources of nectar for honey production. Under a federal law enacted in 2000, genetically modified organisms are regulated as “plant pests” until the U.S. Department of Agriculture is certain they pose no danger to crops, public health or the environment. In 2004, Forage Genetics submitted a request to the USDA to “deregulate” Roundup Ready alfalfa so it could be grown commercially. The same year, the company contracted with Rasgorshek and several other farmers in Idaho, Wyoming and Colorado to begin growing several thousand acres of Roundup Ready alfalfa seed that would be bagged and sold to hay growers. A little more than 14 months after Forage Genetics and Monsanto asked the USDA to deregulate Roundup Ready alfalfa, the department issued an 18-page environmental assessment and, on June 27, 2005, cleared the crop for commercial planting. Today, more than 3,000 farmers now grow it on some 220,000 acres nationwide, including at least nine of the 11 Western states. Geertson, along with other growers, argues that now that the Roundup Ready gene has been set loose in the world, it will be impossible to contain. In fact, he says it has already set off a wave of dire consequences. 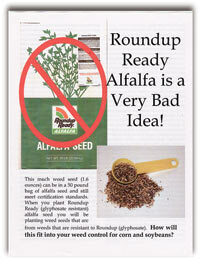 Last year, like Martin Luther nailing his theses to the church door in Wittenberg, Geertson printed up 100,000 copies of a flier with a cover that screams, “Roundup Ready Alfalfa is a Very Bad Idea!” Then he had it inserted in farm newspapers throughout the country. In fact, evidence is accumulating that the older Roundup Ready crops such as soybeans and cotton — and the increased use of Roundup that has accompanied them — have subjected weeds to such intense selective pressure that they, like the sludge-dwelling bacteria from which Monsanto’s scientists first extracted the Roundup-resistant gene, have become resistant to the herbicide. Roundup-resistant horseweed has appeared in Delaware and Tennessee; Roundup-resistant ragweed in Missouri; and Roundup-resistant ryegrass in California. Farmers are increasingly being forced to turn to older, more potent herbicides to control weeds — but even those chemicals sometimes offer little relief. In some parts of Georgia, where Roundup Ready cotton is widely grown, farmers have been reduced to pulling Roundup-resistant Palmer amaranth — a weed so tough that it can damage mechanized cotton harvesters — by hand. For the farmers in Idaho, weed resistance is only one worry. Some local alfalfa growers are also concerned about the agricultural equivalent of secondhand smoke: genetic contamination when bees transfer pollen between genetically modified and conventional varieties of the plant. A bee, says Jim Briggs, another Nampa-area farmer who grows conventional alfalfa seed, is “an independent beast of Mother Nature that you can’t control. They can go anywhere and potentially contaminate the whole industry.” Transgenic contamination is of particular concern for organic farmers, who have successfully argued that the national organic standards should exclude genetically modified crops. In Idaho, Forage Genetics and seed growers agreed to separate Roundup Ready seed fields from conventional ones by at least 900 feet, to minimize the transmission of pollen by leafcutter bees. Yet alkali bees can fly as far as one mile and honeybees as far as three; freak weather such as thunderstorm downbursts can blow bees even farther afield. There is already evidence that the 900-foot isolation distances aren’t enough. In fact, at least one conventional seed company claims that its seed became contaminated even before Roundup Ready alfalfa was deregulated. Woodland, Calif.-based Cal/West Seeds says it discovered the Roundup Ready gene in conventional alfalfa seed that a farmer in Wyoming was growing for the company in early 2005, after one of Forage Genetics’ seed growers planted Roundup Ready alfalfa less than 200 feet away. The same year, Cal/West claims to have found contamination in seed grown in California and Washington. Last year, another company, Dairyland Seed, says it found Roundup Ready contamination in conventional seed that farmers were growing for it in Montana, Wyoming and Idaho. As a result, several seed companies in Idaho now use a kit similar to a home pregnancy test to test every lot of seed that they buy. In February of last year, Geertson and the Washington, D.C.-based Center for Food Safety fought back with a lawsuit against the USDA. They claimed that Roundup Ready alfalfa could contaminate conventional and organic alfalfa farmers’ fields and prevent them from selling their crops; that it could create Roundup-resistant “superweeds”; and that the Department of Agriculture had violated the National Environmental Policy Act by not conducting a full environmental impact statement before it deregulated the crop in 2005. This Feb. 13, U.S. District Court Judge Charles R. Breyer reversed the USDA’s decision to approve Roundup Ready alfalfa for commercial planting. Because of “the possibility that the deregulation of Roundup Ready alfalfa will degrade the human environment by eliminating a farmer’s choice to grow non-genetically engineered alfalfa and a consumer’s choice to consume such food,” Breyer ruled that the Department of Agriculture must complete a full environmental impact statement before it can revisit the question of whether to deregulate the crop. Never before has such a thorough evaluation been required of a genetically modified crop. Breyer also put a temporary injunction on the sale of Roundup Ready alfalfa seed, leaving pallets of the purple-dyed seed sitting on dealers’ loading docks with stop-sale notices stuck to them. It could take two years for the USDA to complete the environmental impact statement. What will happen in the meantime? Late in April, the parties to the case again convened before Judge Breyer in an immaculate wood-paneled courtroom 19 floors above downtown San Francisco. Monsanto had made it clear that much was at stake if Breyer kept the injunction on planting Roundup Ready alfalfa in place while the government completed its environmental impact statement. The company had anticipated the amount of acreage planted in Roundup Ready alfalfa to grow from 220,000 acres to 570,000 this year, then to 1.1 million acres next year. Following Breyer’s initial ruling, Monsanto and Forage Genetics had seized on the idea of “coexistence” between genetically modified, conventional and organic crops. The two companies sent a letter to alfalfa growers asking them to write testimonials about “the benefits of having Roundup Ready alfalfa as a choice for farmers,” and enclosed a response form with space for farmers to describe “HOW I COEXIST.” In the hearing before Breyer, the companies’ attorneys argued that if he allowed the USDA to impose a set of six conditions on growers — including mandatory isolation distances to minimize pollen flow, requirements that alfalfa be harvested before more than a small percentage of it blooms, and orders that any harvesting equipment that comes into contact with Roundup Ready alfalfa be cleaned to keep the seed from conventional fields — farmers could continue planting Roundup Ready alfalfa without contaminating their conventional and organic neighbors. But from his vantage behind the bench, Breyer, wearing a gold bow tie vaguely suggestive of Orville Reden-bacher, was plainly dubious about the plea to allow farmers to plant more Roundup Ready alfalfa while the case continued. Was there a single precedent, he asked the two companies’ attorneys, in which a court had allowed “an increase in the exposure or use of an item under investigation?” The question, it quickly became clear, was rhetorical. On May 3, Breyer ruled that the injunction on the sale and planting of Roundup Ready alfalfa will remain in place until the USDA completes its environmental impact statement. Monsanto is considering whether to appeal the ruling. Still, it is clear that the real world of farming is considerably messier than one that the company’s attorneys described in Breyer’s courtroom. The 3,000-odd farmers who, like Paul Rasgorshek, have already planted Roundup Ready alfalfa can continue growing the crop. But if the forthcoming environmental impact statement does not justify the release of Roundup Ready alfalfa, putting the genie back in the bottle will be considerably harder than, say, recalling a defective automobile. It was a curious position to take, given that Monsanto has spent the last decade all but forcing farmers to buy bundled packages of its seeds and herbicides, while, opponents claim, systematically eliminating its competitors. In fact, the company now faces at least 20 antitrust lawsuits over its actions. Monsanto has assiduously kept the details of its empire-building out of the public eye. When its internal affairs are scrutinized in court, the company routinely invokes trade-secrets protections to keep its documents under seal. Taken together, however, the publicly available portions of the lawsuits currently pending against the company paint the outline of a top-to-bottom strategy to control the seed and herbicide business. The most recent lawsuit, filed by the American Corn Growers Association against Monsanto in February, lays out the basic details. According to the Corn Growers lawsuit, “Monsanto’s plan also included the suppression of herbicide-tolerant trait technologies … that could compete with Monsanto’s Roundup Ready technology.” Between 1996 and 1998, for example, Monsanto acquired a controlling interest in DeKalb Genetics Corporation. Then it quashed that company’s partnership with Bayer CropScience to develop a line of crops resistant to a glyphosate competitor known as glufosinate. In 1997, the lawsuit alleges, Monsanto bought a company called Asgrow and killed a similar effort. “In addition to eliminating actual competition through acquisitions,” the lawsuit goes on to allege, “Monsanto also pursued a strategy of neutralizing potential competitors by entering into restrictive licensing agreements with (the) independent seed companies” that incorporated Monsanto’s Roundup Ready genes into their own seed lines. Under that scheme, Monsanto waives royalty fees and pays rebates to seed companies if crop lines containing Monsanto’s genes make up at least 70 percent of each company’s total sales. Monsanto is also accused of attempting to “cartelize” the seed market and fix prices by entering into agreements with independent seed companies. The company allegedly laid that strategy out in 1996, in what it called the Maize Protection Business Plan. The plan has remained under seal through several different lawsuits, but the Corn Growers allege that it “became the blueprint for Monsanto’s overall licensing strategy to restrict competition in biotechnology seed traits and related markets.” A class-action effort filed by several soybean farmers in the Midwest alleged that during the late 1990s, as part of the plan, top Monsanto executives met with leaders from Pioneer to fix prices for Roundup Ready seeds. Monsanto settled that case out of court last year, but the allegations have been revived in the recent Corn Growers’ lawsuit and several others. According to the lawsuits, cartelization not only gave Monsanto and its partners a way to fix prices, but — by entering into agreements with independent seed companies through which Monsanto aimed to gain control over 90 percent of the seed market — allowed the company to block competitors from entering that market. The most dramatic example involves a company called Syngenta Seeds. Three years ago, Syngenta, which manufactures a glyphosate herbicide called Touchdown, bought the rights to a glyphosate-resistant gene from Bayer CropScience. Syngenta then announced plans to introduce its own Touchdown-tolerant crop line that would have competed with Roundup Ready crops. But Monsanto, according to allegations in several lawsuits, prohibited its partner seed companies from developing any crop lines with Syngenta’s gene — locking Syngenta out of the game. Having controlled the supply side of the glyphosate market, Monsanto also, according to the Corn Growers’ and other lawsuits, imposed a series of restrictive agreements on herbicide dealers and distributors. The company stipulated that dealers could only receive rebates — which often constitute a substantial portion of a dealer’s profits — if their sales of Roundup were at least 80 percent of their total sales of all brands of glypho-sate. Finally, farmers themselves have not escaped Monsanto’s near-total embrace: When they buy Roundup Ready seeds, the Corn Growers lawsuit states, Monsanto “requires (them) to sign a technology license … that effectively mandates that they use only Roundup herbicides” — and not competing brands or generics — on Roundup Ready crops. It seems likely they will also take years to resolve. Biotechnology opponents have a certain fondness for referring to genetically modified crops as “Frankenfoods.” But it’s hard to see alfalfa in the role of monster — even genetically engineered alfalfa. As Jerry Tlucek showed off his field of Roundup Ready alfalfa hay, he pulled one plant, now two years old and 17 inches tall, out of the ground. For the rest of the morning, it lay demurely between the two of us on the bench seat in Tlucek’s truck, next to a knotted plastic bag of sweet corn seed that another farmer had given him. At no point did the alfalfa plant leap for my jugular, or for Tlucek’s. In fact, as the morning wore on, the plant began to wilt. Still, the dying plant suggested an unsettling contradiction. Monsanto has zealously guarded the sanctity of its intellectual property. Yet the company’s prized gene, from the bacterium fished out of the Roundup waste piles in Louisiana, now seems well on its way to pervading our entire food system. It is not hard to imagine the distinctions between conventional and organic, between conventional and genetically engineered — and ultimately between genetically engineered and organic — dissolving, regardless of whether anyone wants such an outcome. George Siemon is the head of the Wisconsin-based CROPP Cooperative, which includes about 670 dairy farms around the country whose milk is sold under the Organic Valley label. Siemon says that the cooperative’s members, who produce, he estimates, about 35 percent of the nation’s organic milk supply, have already been forced to deal with the omnipresence of genetically modified crops. But at one point, we stood behind the cleaning plant and looked out over one of Holtz’s fields, planted with conventional alfalfa. Rasgorshek’s farm, and one run by Leland Tiegs, another farmer who grows Roundup Ready alfalfa seed under contract for Forage Genetics, lay just a couple miles to the south over a low ridge. Both Rasgorshek and Tiegs had made a point of saying how much they respected Holtz’s chops as a farmer, and Holtz made it clear that the feeling was mutual. But looking toward their fields felt like peering across the border between two warring states — albeit one that was proving a lot more porous than anyone had imagined. 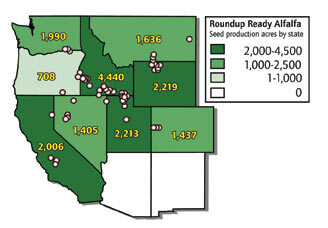 Not all that far away, the next Roundup Ready crop has emerged from Monsanto’s product-development pipeline. 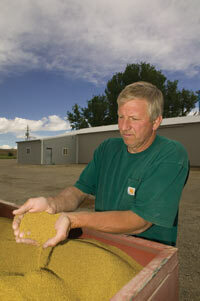 This year, farmers near Worland, Wyo., are growing some 2,000 acres of Roundup Ready sugar beets. And in Oregon’s Willamette Valley, fields of Roundup Ready sugar beet seed will be ready for harvest this summer. The crop’s full release is scheduled for next year. Matt Jenkins is a contributing editor of High Country News.